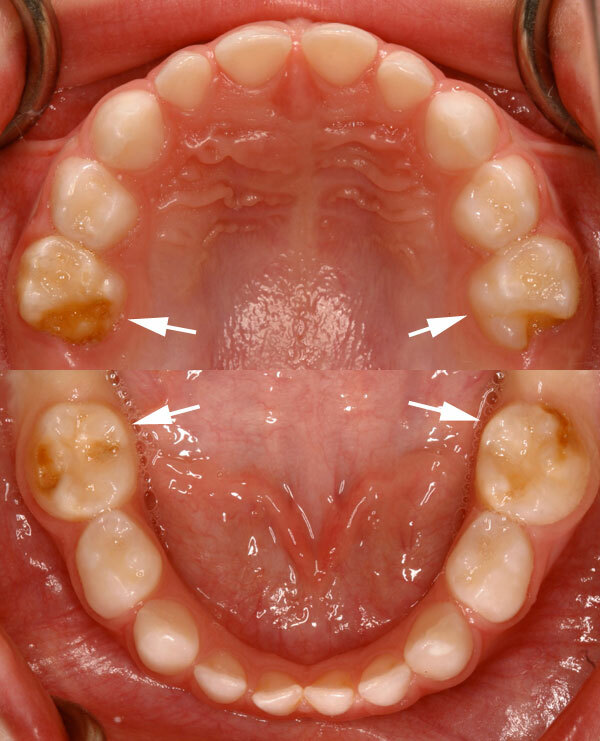 Molar hypomineralisation is a complex and challenging condition of developmental origin that may affect up to a fifth of all children. 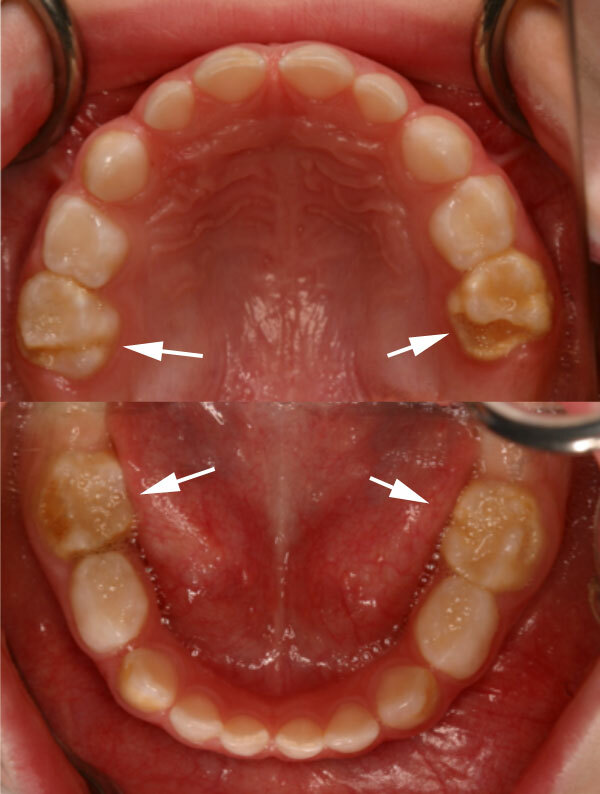 Molar hypomineralisation is characterised by discoloured patches of soft, crumbly enamel affecting the molars and sometimes the incisors as they begin to grow into the mouth. The affected teeth are usually very sensitive, causing the child to experience pain with normal activities such as eating. Because the tooth enamel is soft crumbly, these teeth start to break down when they are used. Dentists call this “Post-Eruptive Breakdown”. These teeth are recognised to be very difficult to restore. 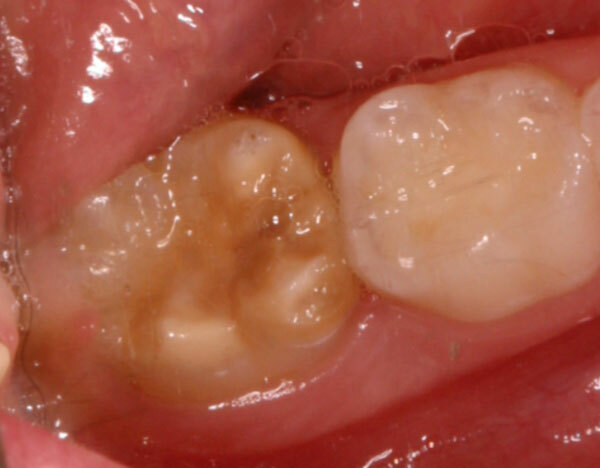 Often the tooth will continue to crumble around a previously placed restoration. Children whose teeth are affected by Molar Hypomineralisation can require ten times as much dental treatment as unaffected children. It is crucial that parents and affected children understand that this is a developmental defect, not the result of poor diet or a lack of tooth brushing, although these will be important factors in preventing further deterioration. Parents should be reassured that apart from the first permanent molars and permanent incisors, the remaining permanent dentition should not be affected. The exact cause of this condition is the subject of ongoing research, and at this time there is nothing that is known to prevent the condition. Effective treatment is possible, but requires careful assessment, often with the input of multiple specialists, and the staging of treatment is often tied to an individual child's growth and developmental age. 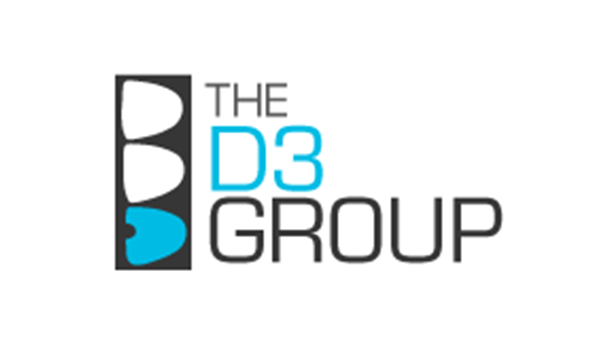 The best results are obtained if the condition is identified as the affected teeth emerge and appropriate early treatment is planned and implemented according to a carefully considered timetable. Treatment options may include symptom control, interim stabilisation, restoration or a carefully timed extraction of the affected tooth or teeth. Affected teeth do not respond normally to local anaesthetic and it is common for children to experience breakthrough pain during treatment even when the whole area seems to be very numb. 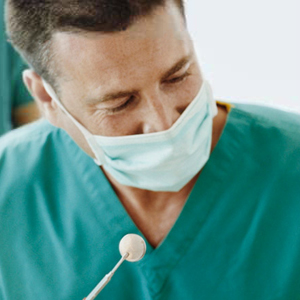 Treatment under general anaesthetic is often an appropriate choice. In addition to adult teeth, the primary molars can also be affected. The second primary molars are an important chewing tooth for ten years or more before they are ready to fall out naturally. 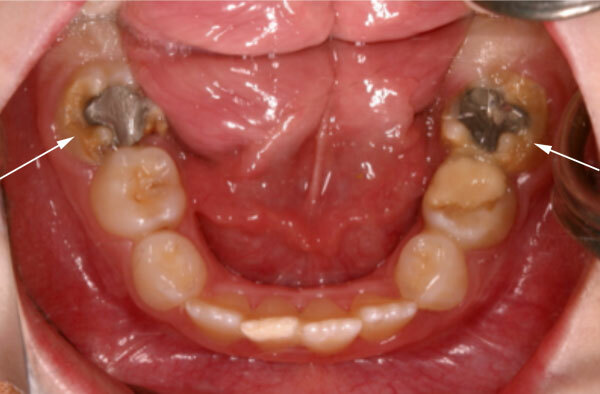 Conventional approaches to treatment using standard filling materials and local anaesthetic frequently fail within six months because the tooth continues to crumble around the filling causing chronic hypersensitivity. 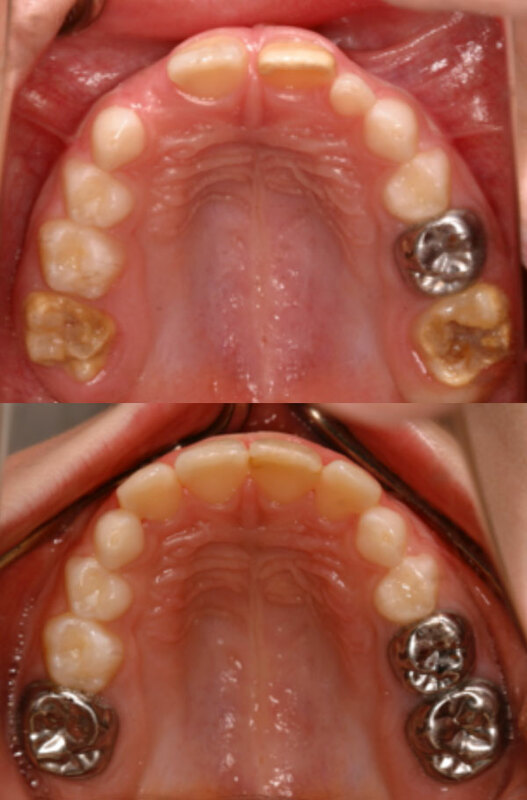 In many cases stabilisation of the affected teeth with preformed stainless steel crowns placed under general anaesthetic is the most appropriate treatment. 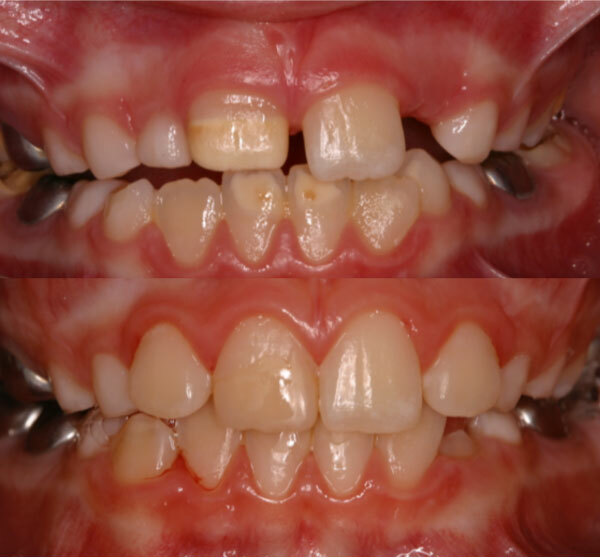 This is a developmental defect, not the result of poor diet or a lack of tooth brushing. 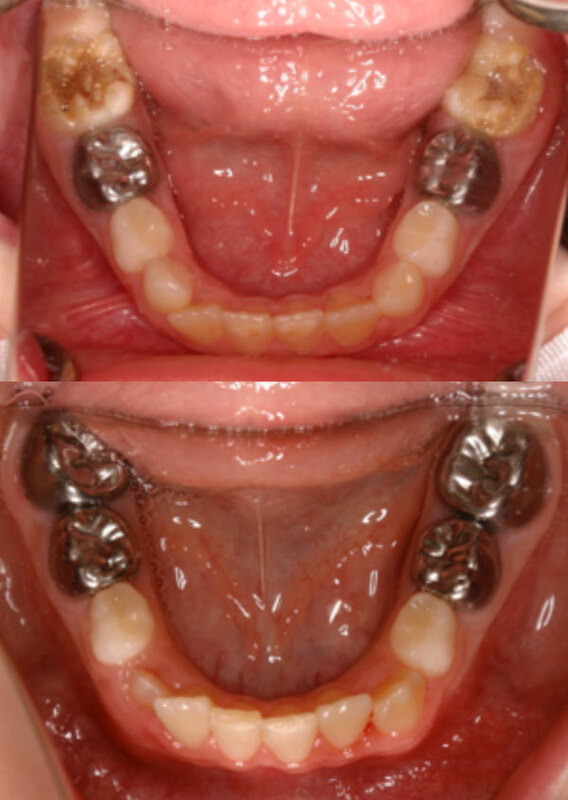 Children with primary molar hypomineralisation are at increased risk of first permanent molar hypomineralisation.